GrumpyJoe had the most liked content! I wonder why I got an email saying a new version had been released last week then? If you look at the version history it shows 2.8.7 as released last week. Why would you be jumping from wattage to replay? In replay you select the wattage you like and when you get to the "puff" you like, you save it. Replay then replicates that same puff over and over again. I think a common misconception is that you use temp in replay to get to the vape you like then save it, but from what I understand, you use wattage in replay to get the best results...that's what I have been doing. I started using temp in replay, and although it does function, you get a better "replay" by selecting /using wattage no matter what the coil material is so I have been simply starting with a lower wattage and raisibg it until I get the vape I like the click save. Someone please correct me if I am wrong. That would not be viable as most people have multiple profiles set up for different wires (i.e. 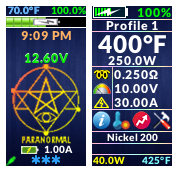 one profile for Ti, one for Ni200, one for SS316L, etc). If we all just used one coil for all profiles then your idea would be feasible, but if I'm not mistaken, each profile has its own parameters and they are not linked at all. Just my opinion. I did not say you accused Frank of having anything to do with Theme Editor, I guess I misread what you posted, you said the overlays were lame and I thought you meant that what Frank had done was lame; apologies if that is not what you meant. Frank has done an amazing job with this theme since he first brought it out for the 75C! Indeed we all could learn more in Theme Editor as it can get quite complex, especially in a complex theme like Frank's and with REPLAY being so new. I'm sure as time passes, there will be more info available on how TE works, I hope that someday there will be thorough documentation vice experimentation. That's the software, not Frank. Just move one control off to the side to access the control or field under it then move it back when you are done editing it. The overlays are not "lame", they are required to do multiple things in the same position on the screen depending on what you are doing. I think Frank has done an amazing job with this theme and it's far from lame. I tried Replay in profile 8,not sure why it has to be 8 since you can enable Replay in any profile, but either way I downloaded v 2.8.2 this afternoon and even profile 8 the preheat is locked at 200W. I will play with the theme tomorrow and see if I can unlock it. In the interim I just turned off preheat just in case. On another note, should the actual material be selected for Replay or is it supposed to be left at "Watts"? I'm worried that temp protect might not work if material is watts, not a big deal since I'm using SS316 anyway, but Ni or Ti could be an issue.